We congratulate Professor Richard H. Thaler at the University of Chicago – this years Nobel Laureate in Economics. Professor Thaler is a central figure within behavioral economics and nudging. The Nobel recognition further solidifies his importance for our understanding of the human mind, and our ability to design a world for the quirks in our brains rather than against them. – Our work at A Win Win World and the purpose of Nudging Sweden is of course deeply indebted to Thaler's research and we send him our heartfelt congratulations. We are proud to walk in his footsteps by helping our clients apply his research to gain both ROI and measurable results in their sustainaibility initiatives, says Katharina Paoli, Managing Director of A Win Win World. 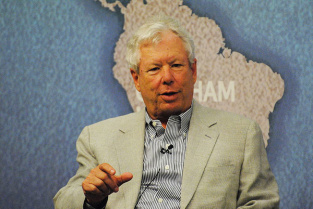 In the interview following the prize announcement, Thaler was asked to comment on in which way he thinks his research has been most helpful. "The most important impact of my research is that economic agents are human and that economic models need to recognize that." To Thaler, this was clear from the beginning. As a young graduate student in economics, he started the field of behavioral economics by casually collecting a list of observations running counter to traditional economic theory. He became increasingly convinced that people often behave in ways that standard economic theory cannot account for. For example, how can a theory positing that people are perfectly rational beings with stable preferences and perfect self-control explain the following weirdnesses? Why do many of us spoil our appetites if cashew nuts are placed on the dinner table, even though we do not want to eat before dinner and would not go and get the nuts if the bowl was in the kitchen? And why is the percentage of people who would buy a (new) 100-dollar ticket to a play lower for those who had already bought a ticket but lost it than if they had recently lost a 100-dollar bill? Money is fungible; the differences between the two scenarios should not matter, according to standard economics. But in real life they do. Thaler set out to explain these violations of 'unicorn economics', as he came to refer to the many fictional assumptions traditional economists employ (Thaler's humorous side is well known). His extensive scholarship includes work on cognitive biases such as framing effects (especially the 'mental accounting' one behind the play ticket difference), the endowment effect (we value things we own more than things we don't) and the sunk cost fallacy (we allow past economic decisions to unduly influence present ones), Moreover, he has designed nudges e.g. for retirement savings that not least draw upon commitments and default rules. (Read more about this below). 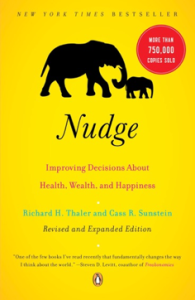 In 2008, Thaler and Law Professor Cass Sunstein wrote the book Nudge: Improving Decisions About Health, Wealth, and Happiness, which kickstarted worldwide interest in the tools now known as nudges. The principles behind the tools were not new, but the highly useful name and the many examples applied to real life were. The proposed ideological framework in the book, libertarian paternalism, also helped people from diverse camps accept the wisdom collected in the book. Together, these factors greatly helped Thaler and Sunstein disseminate their insights into how we all are Humans (Homer Simpson; homer economicus) rather than Econs (Star Trek's Spock; homo economicus) and that we therefore sometimes need help to behave as we really wish to behave. For his contribution to making economics more human, Thaler has long been put forward as a future winner of the Nobel Prize in Economics. 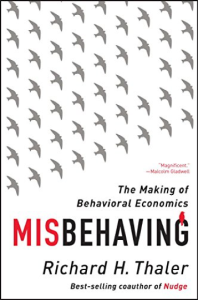 Together with the 2002 prize given to psychologist Daniel Kahneman, a long-time collaborator and friend of Thaler's and the author of Thinking, Fast and Slow, the international recognition now bestowed upon Thaler means that behavioral economics has finally earned its rightful place as an undeniably integral part of economics. The discipline's tools will now become even more firmly placed in the repertoires of modern policymaking as well as in smart business practices. Two real-world applications of Professor Thaler's work are especially well known. The first is his strong contribution to the founding and great success of the Behavioural Insights Team, the world's first so-called 'Nudge Unit'. BIT was launched by ex-prime minister David Cameron to help the UK government increase efficiency in various policy programs. It is now a private enterprise. The second is Save More Tomorrow, a successful nudge designed by Professor Thaler and Professor Shlomo Benartzi (TED talk about the program here). An American program for retirement savings, Save More Tomorrow utilizes three facts within behavioral science: our tendency to value the present more than the future, our tendency to want to avoid losses much more than realize gains, and our tendency to not always act as we have planned (think New Year's resolutions that go unfulfilled). Instead of falling into these traps, Save More Tomorrow asks employees not to immediately increase their retirement savings but to instead do so at their next paycheck raise. They stay then stay enrolled in the program, and automatically contribute more and more, without having to make any more choices – unless they opt out, of course. This nudge is helping thousands of Americans achieve more secure pensions. Go to our Press page (for Swedish version, go here) to see a collection of articles on Professor Thaler written within the first 24 hours since the award announcement.